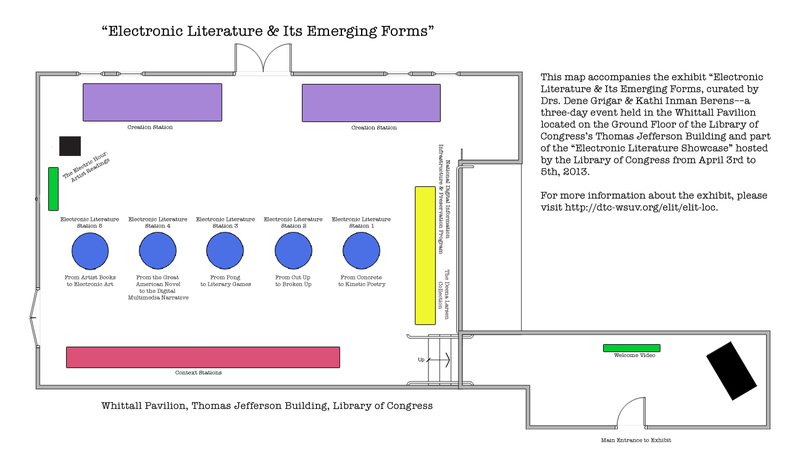 “Electronic Literature & Its Emerging Forms” is organized in three main sections: Electronic Literature Stations, Context Stations, and Creation Stations. Below is the list of Electronic Literature Stations and the authors and works found at each. Special Addition to Electronic Literature Station 2 on Friday, April 5, 2013, from 10 a.m.-1:00 p.m.: Items from “The Deena Larsen Collection,” made possible the from Maryland Institute for Technology in the Humanities. This special addition to the exhibit from the Maryland Institute for Technology in the Humanities includes unique material artifacts related to the composition and exhibition of Marble Springs and other pathbreaking works of electronic fiction.